BLACKFIRE Iron Remover 128 oz. It's time for your car and fallout to have a falling out! BLACKFIRE Iron Remover is designed to effectively remove iron contamination from your paint surfaces and wheels. The formula for BLACKFIRE Iron Remover contains special agents that bond with iron particles on a molecular level and pull them off your car�s surface. Simply by existing, your car is exposed to large amounts of industrial fallout and iron contamination, so let BLACKFIRE Iron Remover keep your paint clean and protected! Vehicles face an onslaught of contamination every day. Be is rain, dirt, dust, bird dropping, bug remains � you name it. If it�s in the air, it�s on your car! And those are just the contaminants that you can see! What about the industrial fallout created by metal particles in the air? Those are harder to see, but believe us, they�re there! When those particles are allowed to dwell on your paint, they can cause erosion and rusting � not to mention the impairment to your perfect finish! BLACKFIRE Iron Remover is color-changing and turns from clear to purple/red when in contact and during the removal of embedded iron contaminants! 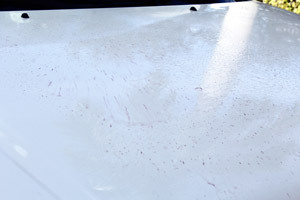 It�s important to remove all of these iron particles from your paint to avoid any future damage. The easiest way to do that? BLACKFIRE Iron Remover! This fast-acting, color-changing formula that works to dissolve and remove embedded ferrous iron contaminants in your paint for an advanced clean. BLACKFIRE Iron Remover chemically bonds with iron contaminants in your paint and will remove them from the surface safely and efficiently. In a perfect world, BLACKFIRE Iron Remover would be the only prep you needed, but as it only removes iron particles from your wheels and paint, claying your vehicle after using BLACKFIRE Iron Remover is necessary. But don�t worry! BLACKFRIE Iron Remover also doubles as a heavy-duty wheel cleaner, so that step is completed as well! 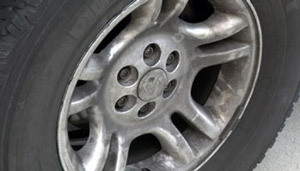 BLACKFIRE Iron Remover, in addition to removing iron contaminants from paint, is also an extremely effective wheel cleaner. 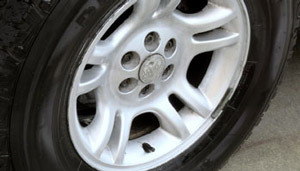 BLACKFIRE Iron Remover quickly removes embedded brake dust from wheels - both decontaminating and cleaning them! 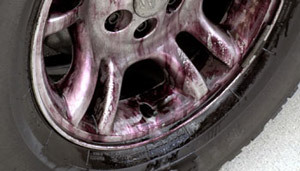 Just as it works to remove iron particles from your paint, BLACKFIRE Iron Remover will remove embedded brake dust from your wheels� finish as well. In fact, that�s one of the most popular areas to see the famous color changing action! BLACKFIRE iron Remover chemically decontaminates your painted surfaces, wheels, and glass and prepares the surfaces for more intricate paint correction and protection! 1. 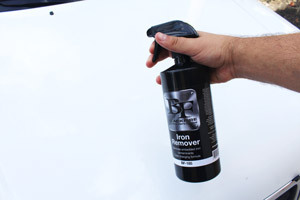 BLACKFIRE Iron Remover can be applied to dirty paint before washing the car. 2. Spray directly onto the surface to be treated and allow to dwell for 3-5 minutes. 3. As BLACKFIRE Iron Remover reacts to paint contaminants, the formula will turn from clear to purple/read (that�s how you know it�s working!). 4. Rinse treated surfaces with water and continue with your regular wash/detail. Related Items - BLACKFIRE Iron Remover 128 oz.